The defeated outgoing Gambian President Yahya Jammeh all of a sudden is a constitutional scholar. Since he was defeated at the polls on December 1st, the very person who has desecrated the Gambian constitution with total impunity is now worships the constitution like the Bible. For 22 years Yahya Jammeh has issued executive orders without regard to the letter of the Gambian constitution. 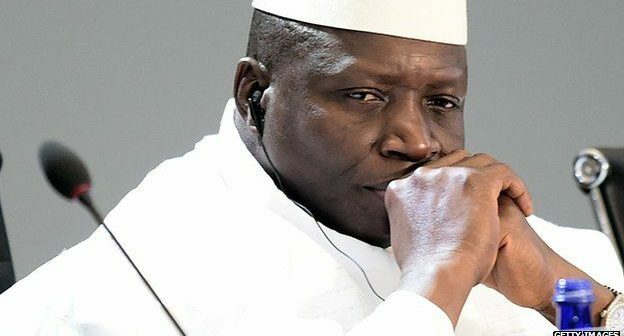 Yahya Jammeh today on national television admitted that for 22 years he has been issuing executive orders in total disregard to the constitution to arrest and persecute citizens. Today he issued a usual order to NIA to not arrest and detain anybody due to the political impasse. Someone forgot to teach Yahya Jammeh that in a Constitutional Democracy the constitution is the supreme law of the land and all governing activities must be drived from the constitution. That in such a governance structure, there is nothing like executive orders to arrest citizens. Law enforcement and security personnel must go by the letter of the constitution to search, arrest and or prosecute citizens. There cannot be executive orders to arrest or jailed citizens much less interfere with judicial proceedings. But Mr. Jammeh forgot all the illegal orders he has been given for two decades. 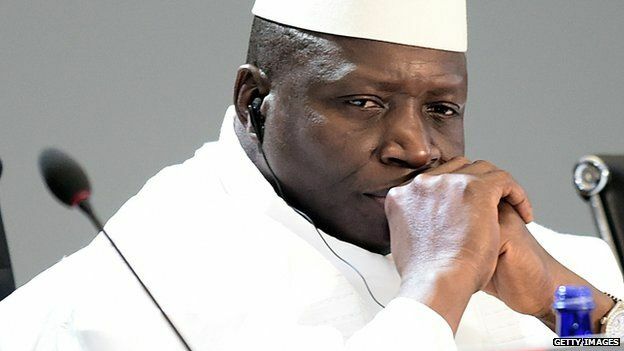 Despite the fact that he has hired and fired supreme court judges at will and have openly interfered with Judicial proceedings in the Gambia without any respect for the constitutions, Yahya Jammeh is now ‘the champion of Constitutional Democracy’. Of course this is all designed to suit his play book so he can get his usual way of treating the constitution like his own diary. Mr. Jammeh ordered on countless times the arrest, torture and illegal detention of citizens sometimes up to 2 years without a single appearance in a court of law. He has ordered his mercenary judges from Nigeria and other poor African countries to deny the accused bail and send scores of them to jail for politically motivated cases. Mr. Jammeh has been the judge, the jury and the prosecutor for 22 years without regard to due process of the law. Yahya Jammeh has abused the office of the executive by taking bribes and kick backs from businesses simply because of him occupying the office of the president. He has seized private business and public corporations and turned them into his own. All these in gross violations of the constitution and the fairness doctrine. Since 1997 when the Gambian constitution was amended and ratified Yahya Jammeh has totally disregarded the law and has issued illegal executive orders time and again. He has gone from rags to riches living above and beyond the law. Mr. Jammeh amazingly now wants Gambians to believe that he is a constitutionalist, that he is “a man of peace” and God fearing. The same Yahya Jammeh who has personally ordered the killing of innocent citizens, threatens and buried some six feet deep is all of a sudden “a man of peace and God”. Is Mr. Jammeh really well or is he continuing to take the Gambian people for granted? How can Yahya Jammeh face the family of Solo Sandeng, Krumah, Deyda Hydara, the mothers of April 10th & 11th, the Daba Marena and co, the Mile II 9 prisoners executive and hundreds of other Gambians and tell them he is a man of peace. Mr. Jammeh as the Civil Rights Iron Dr. King said “peace is not the absent of war but the present of justice”. The Gambian people have been facing brutal war waged by their own government on them for two decades. Majority Gambians can tell you that there has not been peace in their homes, in their marriages, in their work places and most importantly in themselves. The people have not been at peace so long as they safety and security were threatened, their economic well being were undermined and their personal properties forcefully taken. Yahya Jammeh the path for you is very clear and when you take that path you will not require amnesty. You have been rejected and defeated by the Gambian people and you have no more recourse to hand on to power. You must do yourself and your people justice and leave the Gambian people to inaugurate their new president-elect Barrow. A new dawn has risen in Gambia and nothing can stop that train. The people have tested freedom and have taken back their liberty and dignity. As you see more and more of your own loyalists desert you in numbers, you must start to find a place to retire outside of the Gambia. For the longest people of good will whom you regarded as enemies have given you hints and pointers time and again to safe your soul but to no avail. So Mr. Jammeh please do yourself a favor and stop being a constitutionalist. You are a dictator and will always remain one until eternity! Mr. Jammeh the worst part of your 22 years in power is the legacy you left behind. Unfortunately, you will be remembered on the footnotes of history as one of the dumbest African leaders ever to have surfaced. You will be remembered by little boys and girls in their memories as someone who deprived them of a fatherly love. You will be remembered by innocent women of taken their husbands, sons and making them widows at a tender age. Mr. Jammeh you will be remembered as a man who speaks the word of God but every action that follows emanates from evil. You will go down in history as the most ungrateful son Gambia and African has ever produced. One who came from nothing, rose to become everything but squandered everything and lived a miserable life. Mr. Jammeh when your history and legacy is written your fellow human beings will regret knowing and associating with you as a human being. You will go down as a man who victimizes innocent citizens, wants everything and who end up losing everything. Good bye Yahya Jammeh whatever you decide to do leave the Gambian shores in peace and Rot in misery! May the Quran you Hold in your hands reveal your true nature! This deranged fool thinks people are stupid like him. The only reason he is coming up with all this garbage is because of the humiliation he suffered at the Supreme Court yesterday. After announcing to the whole world that there will be a Supreme Court on the 10th Jan 2017, he was made fool of by the Judges. Having been humiliated, he must have had a long conversation with his two stooges Clown of Defence Staff (CDS) Badjie and Ignorant Goon of Police (IGP) Sonko and it must have been apparent to them all that the end is imminent. I am guessing that must have been the reason why he asked ECOWAS to postpone their visit till Friday. He wants to buy himself time to cooked up some stupid idea. He is in no position to call the shots now. President elect Barrow and his team should start to take a tough stance now and tell him where to go. If Mr Barrow and his team accepts a blanket amnesty to Jammeh and his cohort, I will personally start a petition to challenge such amnesty in the courts.